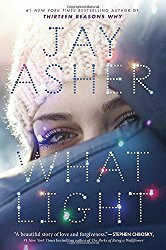 For our October giveaway, we continue to celebrate the paperback release of guest author Jay Asher’s WHAT LIGHT! For details (and to read Sweetheart Darcy Wood’s fun interview with Jay), check out last week’s post. All you have to do to enter to win a copy of WHAT LIGHT is comment on that post. The randomly selected winner will be announced on November 2.